Nuhaus Ltd is a construction company based in 721 Northwest Business Park, D15 YD30. The company currently operates and services the Leinster area catering for clients in the private, industrial and commercial sectors. At NuHaus ltd we have spanning range of trades and professions all of which are required to design and complete all our building projects. We pride ourselves on customer care and satisfaction and all our staff members have this at their core while working with our clientele. 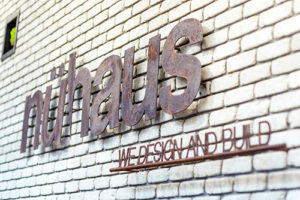 Nuhaus will only price work and enter into a contract with a client once approved plans are in place. We feel plans are a fundamental aspect of a new build. In Order for any construction project to run smoothly – design is the key! It enables the client to visualize their dream build prior to a block being laid. Detailed Architectural plans enable Nuhaus to provide their clients with accurate quotations. All materials including glazing & bespoke features can be pre-ordered to precise specifications & dimensions as per plans. Detailed Architectural plans allow all the various construction crews and subcontractors to work off a universal masterplan minimising errors and confusion in the build. As this can happen when there is multiple staff or various companies on one site. i.e ground crews, bricklayers, steel & glazing erectors, roofers, electricians, landscapers, painters & decorators, Kitchen and bathroom providers etc. Site survey pre build which will highlight any drainage, tree stumps, party wall issues with neighbours eradicating over budgeting due to unforeseen site characteristics or services. Plans required for planning authority (where Applicable), or when applying for exemption. Legal aspect, when selling for example. Plans are also vital to the written contract between Nuhaus & our client, as it offers a visual agreement of what the client ultimately is paying for. Nuhaus can provide you with Architectural services Dublin. Once plans are finalised Nuhaus’ QS will prepare a bill of quantities which will be issued to the client. If the client is not happy with the quotation issued by Nuhaus – As the plans are the client’s property they can be used to obtain planning permission or to be issued to other builders for Tendering. Ultimately the client will still have approved plans for their project and more direction with their build. Feel free to call us and discuss. A Chartered Engineer is nominated for the stage inspections and steel calculations on site (covered by PI Insurance) Our engineers will design, inspect and sign off on all aspects of the build in structured stages.